Hate collecting your money? Join the club. Recent OPEN Small Business Network Polls from American Express shows accounts receivables is the top cash flow concern of small business owners. To ensure that you get paid, use the following debt collection tips and best practices. Don't take it personally if your customers aren't paying their bills on time. Look into why the bill is late. It could be your client simply forgot. To help avoid these types of missed payments, provide a gentle reminder immediately following the invoice due date. One of the secrets of small business debt collection is to gradually increase the assertiveness of your follow up communication over time. Your first call, letter, or email should give your customer the benefit of the doubt with a positive and helpful tone. But by the third collection letter or correspondence, the tone may be more direct and assertive (but never offensive or unprofessional). In today's electronic age, handling invoicing and debt collection over email is simple and quick, but it's not without its concerns. Email correspondence can easily become buried in an overstuffed inbox. Use additional means of reaching out to your customers who have missed a payment. Picking up the phone is a great first step, whereas a certified letter may be called for after weeks of no response. As a small business owner, the temptation is great to have the salespeople handle their own accounts receivables, but it's much better to assign one person to the task of debt collection. Designate your debt collection lead and provide proper support, training, and incentive to do the job right. After numerous calls and collection letter correspondence, you may reach a point where the account is long overdue. If necessary, you might consider bringing in a collection agency to handle these delinquent clients. Spending too much time and resources can be draining on your operations. There are laws and regulations that govern how collection agencies can go about collecting the debt. Debt collectors cannot lie to, mislead, or harass your customers. Make sure the collection agency you select abides by the Fair Debt Collections & Practices Act (FDCPA). Reduce your overdue accounts by running a credit check on your potential client or customer before the deal is done. Expect to spend at least $30 on a Dun & Bradstreet (D&B) report. D&B uses self-reported data but adds credibility by including banking data from company suppliers, bankruptcy filings, media sources, suits, liens, and judgments. Any small business planning to sign a "big deal" would be advised to run trade and bank reference checks. Simply reaching out to your potential client's or partner's bank can reveal important banking relationship information and how they have maintained their accounts in the past. Like a background check, taking this step can identify potential red flags before an invoice is even printed. Handling the debt collection process is a responsibility of successful business ownership. Too many small businesses place aging receivables and collections as a low priority. It's important to monitor your cash flow and aging receivables on a monthly basis or more. It's ok to write off bad debt, but in the end, it's your business savvy to handle the matter that will impact your growth. 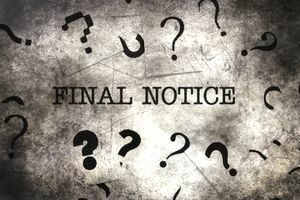 Need help writing a debt collection letter? Review ​sample collection letters to get ideas.